MAGNOLIA Gotcha ice creams capture the imagination with an alluring combination of innovative shapes and flavours. The all-new MAGNOLIA Gotcha Astronaut takes the palate on a thrilling ride across the galaxy with its novel spaceship-inspired design. Its rich, full-bodied chocolate flavour will swoon even the most ardent chocoholics. Truly decadence on a stick, the MAGNOLIA Gotcha Astronaut makes a lovely treat for children and even adults to enjoy anytime, anywhere. The MAGNOLIA Gotcha Astronaut has been awarded the ‘Healthier Choice Symbol’ by the Health Promotion Board – thanks to the fact that it contains no trans fat and has less than 200 calories a stick! 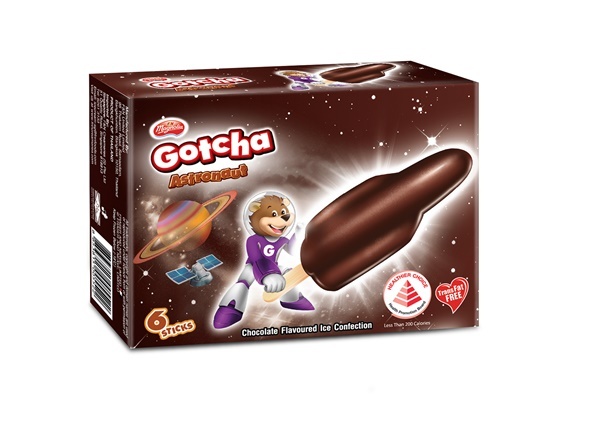 You can get MAGNOLIA Gotcha Astronaut for in box (6 sticks) for S$3.30 at major supermarkets and hypermarkets, or single serves of S$0.60 a stick at selected minimarts and provision stores (price stated are recommended selling price).